Have you been involved in a hit and run car accident in Long Beach or Seal Beach? Were you in a car accident caused by a driver who has cut-rate car insurance in Huntington Beach or Newport Beach? Regardless of where in Orange County your car accident occurred, you probably have available insurance coverage for that. This discussion will start by explaining what Uninsured and Underinsured Motorist insurance coverage is. Then we will discuss where to find out if there is coverage for these claims in a car insurance policy. From there, we get into ways that our office and other injury law firms deal with insurance companies. We discuss how to get them to pay for the damages incurred by injured drivers in Southern California. With this information in hand, we hope that you feel prepared to talk to an injury lawyer about what your options are. 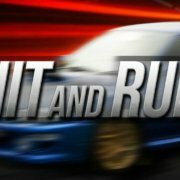 In California, hit and run accidents happen all too often. To make matters worse, they often lead to tragic results. California led the nation in 2018 with the highest number of fatal hit and run car accidents. Unfortunately, drivers in Orange County are not exempt from these statistics. For example, on December 6, 2018, a hit and run car accident in north Long Beach led to the wrongful death of a 54-year-old pedestrian. In Bolsa Chica, a hit and run car accident / bike accident led to the wrongful death of a 64-year-old man. The Seal Beach Police Department is no stranger to these accidents either. In the past, they have asked for help finding hit and run drivers. In Newport Beach, at least two people have been killed in hit and run accidents since 2015. Wherever these fatal car accidents occur, news coverage is often fierce, and manhunts usually commence. However, the news usually does not cover what happens when an uninsured or underinsured driver causes a car accident. Unfortunately, these types of car accidents also occur too frequently. A study published by the Insurance Research Council in 2017 found that one in eight drivers were uninsured. Sadly, if you are in a car accident caused by one of the seven out eight drivers that do have insurance, there is no guarantee they have enough insurance. In California, a driver is only required to have $5,000 of motorist property damage coverage. Concerning bodily injury coverage, a driver is only required to have $15,000 per person and $30,000 per occurrence. This same minimum coverage will also apply to a wrongful death claim. If this amount seems too low to you, then you are not alone. Even Mercury Insurance advises its customers “minimum insurance coverage may not be enough to ensure that you, your family and your assets are fully protected.” Nonetheless, at fault drivers in California often have minimum liability insurance. So what are you supposed to do if you are in a car accident with someone who has no or too little car insurance? The first thing that someone involved in any car accident should do is pull to the side of the road. Once a driver has made sure they are clear of oncoming traffic they should determine if anyone was injured. If anyone was significantly injured, call a paramedic for assistance. While you are on the phone with 911 make sure to tell them you need to file a traffic collision report. If the accident was a hit and run accident, most insurance companies require that the driver submit a police report within the first 24 hours. Even if the other driver does have insurance, file a police report. A police report will document what happened and determine who was at fault. Therefore, it is imperative that a report is filed immediately regardless of which of these scenarios occur. 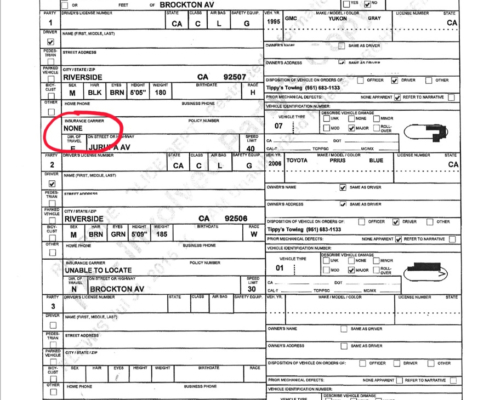 This above example shows where in a police report insurance coverage is listed. In this example the other driver was uninsured. After the police have taken a report, assess your injuries and contact an injury lawyer. If an uninsured motorist caused property damage to a car, then the driver will have to figure out who will pay for the damage. Similarly, a driver received medical treatment; then there will be a bill for repayment. Our California injury attorneys regularly advise drivers how to recover maximum payment for these damages. In the event, the at-fault driver had no insurance, one of our injury attorneys might start by looking for Uninsured Motorist coverage. This type of coverage is in the faultless driver’s insurance policy and applies in one of these situations. It is important to know that there are two types of Uninsured Motorist Coverage. The first type of Uninsured Motorist coverage is for the policyholder’s personal injuries. There is also Uninsured Motorist property damage coverage. This type of coverage is used to cover property damage to a policyholder’s car. If you are wondering if you have these coverages, you probably do. Most states require uninsured motorist insurance coverage unless the policyholder signs a waiver. This above example shows a car insurance policy with significant uninsured motorist coverage. In the event, the at-fault driver only had the state minimum insurance, one of our injury attorneys would look for Underinsured Motorist insurance. Just like Uninsured Motorist insurance, this type of coverage is in your the faultless driver’s policy. Despite the similarity in names, there is a slight difference between the two types of insurance. Uninsured Motorist insurance applies in the event of a hit and run or when the other driver has no insurance. Underinsured Motorist insurance only applies when a driver has more damages than the at-fault driver has insurance. For an example of how these two coverages work let’s look at the following examples. An at-fault driver rear-ends another car in Huntington Beach. The at-fault driver was driving without car insurance. As a result of the car accident, the driver who was rear-ended suffers a broken bone. The injured driver goes to the local emergency room. Their recovery consists of months of rest and physical therapy. The injured driver has $50,000 in total medical bills and lost wages from the car accident. The injured driver contacts a Huntington Beach injury attorney and asks what they can do. The injured driver has $100,000 in Uninsured Motorist insurance. In this example, the injury attorney would contact the injured driver’s insurance. The injury attorney would then gather all of the driver’s medical records and bills. The injury attorney would also likely collect proof of the injured driver’s lost wages. Once the injury attorney had all the necessary documentation, they would submit a demand to the insurance to pay all of the injured driver’s damages including pain and suffering. At this point, the injury attorney and the insurance company may reach a settlement agreement. A settlement agreement should make sure the injured driver gets fairly compensated for their injuries. An at-fault driver rear-ends another car in Huntington Beach. The at-fault driver only has $15,000 of car insurance coverage. As a result of the car accident, the driver who gets rear-ended suffers a broken bone. The injured driver goes to the local emergency room. Their recovery consists of months of rest and physical therapy. The injured driver has $50,000 in total medical bills and lost wages from the car accident. The injured driver contacts a Huntington Beach injury attorney and asks what they can do. The injured driver has $100,000 in Underinsured Motorist insurance. In this example, the injury attorney would first contact the other driver’s insurance. The process then proceeds as previously described. The injury attorney would gather all of the injured driver’s medical records and bills. The injury attorney would also collect proof of the injured driver’s lost wages. Once the injury attorney had all the necessary documentation, they would submit a demand to the other driver’s minimum insurance policy for the available $15,000. Once the other driver’s car insurance pays the policy then the claim is completed against the third party. But wait, that still leaves $35,000 in medical bills and lost wages! At this point, the injury attorney will then contact the injured driver’s car insurance. After exhausting the third-party coverage, the injury attorney will initiate an Underinsured Motorist claim. 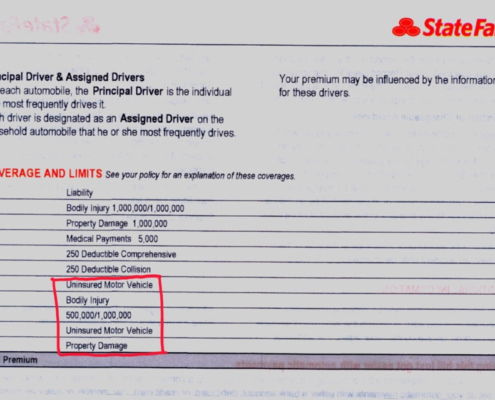 The remaining available coverage is the difference between the Underinsured Motorist Coverage and the third party liability coverage ($100,000 [Underinsured Motorist Coverage] – $15,000 [Third Party Liability Coverage] = $85,000 of available Underinsured Motorist coverage remaining). The injury attorney will then maximize the remaining $85,000 of coverage to make sure that the injured driver has money for all their damages including pain and suffering. Thus, the value of both of these coverages becomes quite clear. If a hit and run car accident occurs or an uninsured driver hits you, you need Uninsured Motorist insurance. If an at-fault driver with minimum car insurance injures you, then you need Underinsured Motorist insurance. Regardless of which of these situations a driver faces it is important to contact an injury attorney right away. An injury attorney will walk the injured driver through the insurance claims process. The injury attorney will help the injured driver comply with all of their insurance policy requirements. This part is essential in maintaining coverage for your claims. Finally, the injury attorney will know how to maximize the insurance claims process. This process includes making sure the injured driver receives fair compensation for all of their injuries including pain and suffering. Therefore, if you were in one of these car accidents, we recommend you contact one of our Seal Beach injury attorneys immediately! 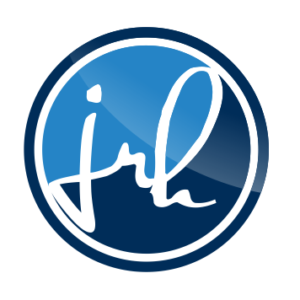 If you were in a car accident and desire to learn more, head over to our car accidents page. The information contained in this post is for general information purposes only. Nothing on this post, or website, should be taken as legal advice for any individual or case situation. This information is not intended to create, and receipt or viewing does not constitute an attorney-client relationship. If you have lost a loved one in a wrongful death action or have pain and suffering from a personal injury case we are available to assist. For a free consultation please reach out to our attorneys to arrange a time to discuss your case. All you have to do is go to our site map or hit the big blue button labeled Contact Us!